behind his right shoulder when this buck appeared. This was a 5-1/2-yr-old, 12 pointer. There's a lot of fresh deer tracks and droppings in the south end of our leased area," my son John had mentioned a few days earlier. With a light breeze blowing from the south I decided to give that area a try on the last morning of our 2009 hunt. My destination was an old, north-south, 100-yard-long section of logging trail covered with deep grasses  a natural shooting lane with dense, six- to 10-foot evergreens on the east side and mature aspens on the west. This trail is also edged with lots of much-browsed red osiers, a favorite winter food of our northern whitetails. It was a good two miles southeast of camp, an hour and a half of tough hiking with no marked trails to follow in the pre-dawn darkness. To make matters worse, everything was covered by a thick mantel of sticky, new-fallen snow that made landmarks difficult to distinguish against the starlit sky. About the time the southeastern horizon began to brighten, I unexpectedly found myself facing 60-foot-tall spruce trees. I then realized I had overshot my destination by at least 300 yards. While pondering how to best get back to the old logging trail, I noticed very fresh deer tracks a few feet away. Stepping nearer, I silently whistled. The tracks were a good four inches in length (not including dewclaws). They were obviously made by a fully mature buck, heading west toward where I should have been seated at this very moment. Assuming the buck knew the best route to get there, I began following its tracks. Shortly, another set of four-inch tracks joined those in front of me from the left. Two big bucks were now ahead of me. Ten minutes later I stepped onto the grassy logging trail. Dark water oozing into the two sets of tracks at my feet indicated the bucks (walking and therefore unalarmed) had crossed only minutes earlier. The natural blind I had in mind  three small spruces next to the logging trail  loomed 40 yards away downwind. Hoping one or both bucks would return later, I quickly tiptoed to these trees, placed my backpacked stool behind them and sat down. An hour later a doe, following the same path taken by the bucks and me, walked across the grassy opening. Unfortunately, that was it for the morning. When my son, John, my grandson, Jimmy, and I headed north to scout in preparation for our 2010 firearm deer hunting season, tracks of those two big bucks were vivid in my mind. "Before we head home," I told them, "I've got to find an easy-to-follow route to that old logging trail and select a ground level stand site for hunting there while the blows from the south." For some strange reason, we've had a warm, south wind on the opening morning during most of our past 20 November deer hunting seasons. [Note from John Nordberg  Doc's oldest son: I apologize for interrupting my father's article. However, sometimes I just can't stand it. Recently I came across a blog where people were talking about my father. It is amazing how some people get the facts so completely wrong! Someone on the blog stated that Doc Nordberg "does not believe in hunting from tree stands." Wow! I was shocked! This couldn't be further from the truth! Deer hunters now use tree stands almost solely because of my father! This is a case where one man's wonderful insights made a dramatic change in his field  in my father's case, in the field of whitetail deer hunting. At this time, my father is semi-retired. He still writes for Midwest Outdoors. However, he has not lectured or had a booth on the hunting show circuit since about the year 1999. I understand, because of this, many of our new, young hunters have never met, seen, or heard of my father. 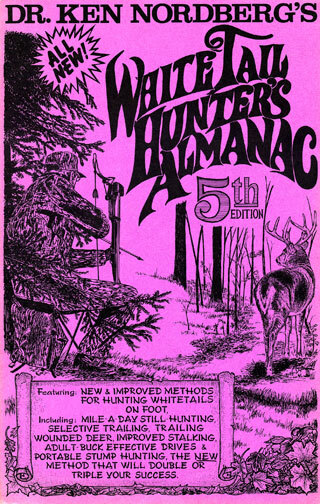 What they have really missed is the hundreds of amazing hunting show seminars that my father once gave  shows that "cleared the floor" and allowed all of the vendors at the shows to take a bathroom break! 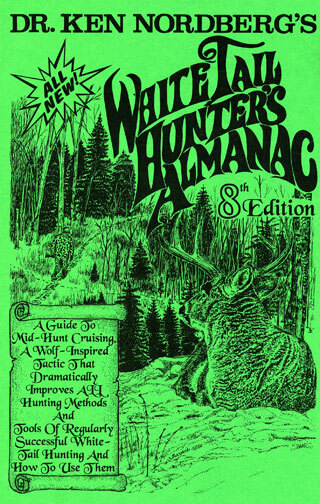 Then, after his hunting show seminars, he was always swarmed by hundreds of hunters purchasing his Almanacs and Sign Guides. Most young hunters are unaware of what he has done to revolutionize deer hunting. However, most of the "old-timers" know! There is no doubt, because of my father's years of research, writing, promoting and evangelizing  because of Doctor Ken Nordberg  hunters now use tree stands. 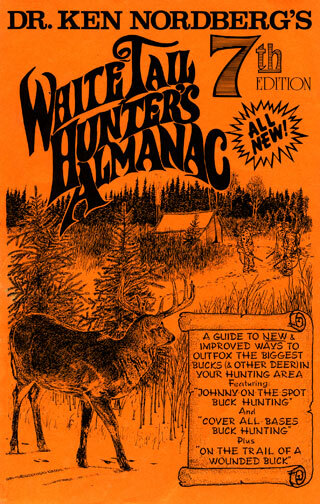 In his early writings and seminars, he was the first outdoor writer and whitetail hunting expert that recommended that deer hunters use tree stands. 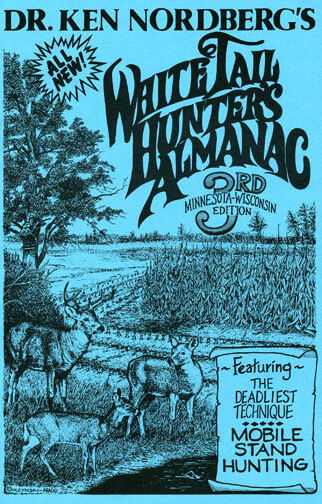 In the early 1970's, he did research  formal, professional, biological research on whitetail deer. He defined the, "Stages of Alarm" whitetails go through. He defined the, "Stages of the Rut." (His writings on the Stages of the Rut are plagiarized every year.) He taught how to identify deer based upon the size of their tracks, droppings, ground scrapes, and beds. He taught us about, "Buck Bedrooms." (He coined the phrase in case you didn't know.) He first researched, then taught us about scents, cover scents, and lure scents. He helped create the Lure Scent industry. He taught us about ground scrapes  eliminating all of the foolish myths. (Unfortunately, it seems many of the old foolish myths in this area are making a comeback.) He taught us about the classes of antler rubs. He taught us about hundreds of factors that affect whitetails: the wind, the moon, the temperature. The list is endless. Perhaps most importantly  he taught deer hunters all about tree stands. He taught us all about how to build tree stands. He taught deer hunters all about how to locate their tree stands. He taught deer hunters all about how to hunt from tree stands  the tactics. 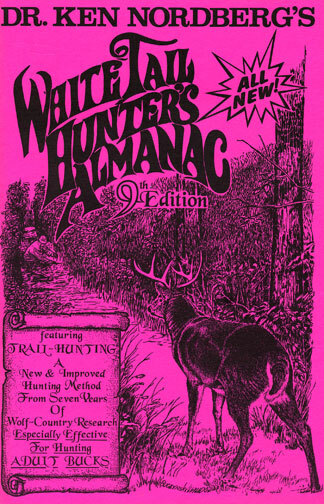 He was teaching us deer hunters how to hunt from tree stands even before commercial tree stands were available. There is no doubt, the commercial tree stand industry directly resulted from writings and teachings of my father. An early black and white photo of one our platform treestands. (About 6 feet off the ground.) Black and whites were used by my father in his published articles because color photos were not usually used by outdoor magazines at that time. 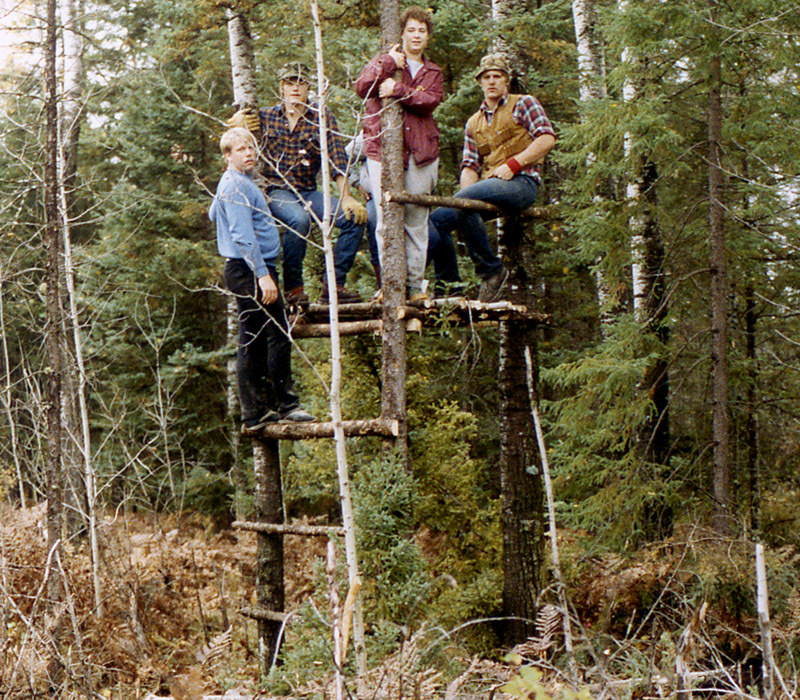 I recently found and scanned this slide of one of our early treestands. 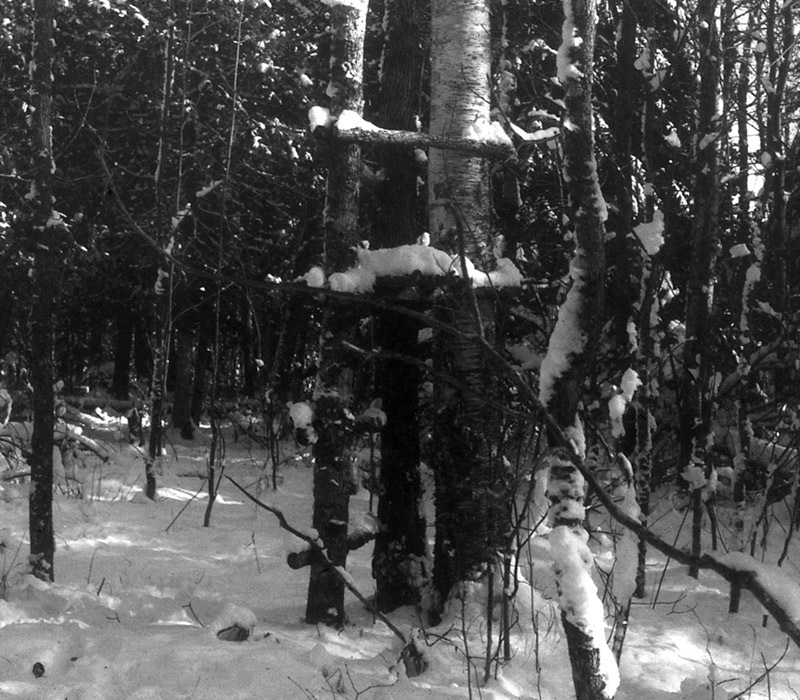 This early "chain saw treestand" and photo was one of many that he used in his early research & writings. 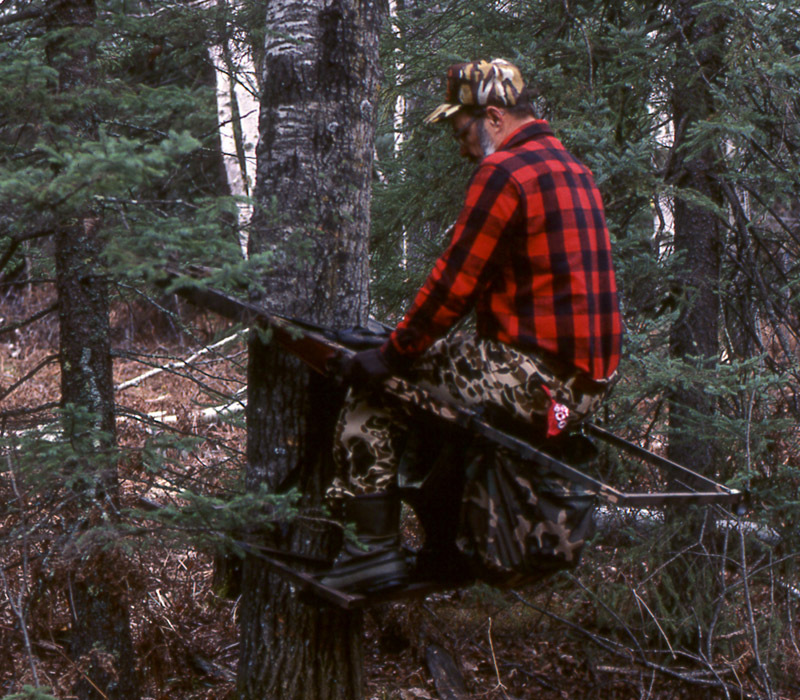 Because commercial treestands were not available, Dr. Ken Nordberg taught us how to make treestands using just a chain saw, a hammer, and large nails. If I remember correctly, at this location, a good grouping of 3 good trees was not available  the center vertical that Peggy is holding was a free-standing log. This photo is from about 1978  left to right: Kevin Stone, Ken Nordberg, Peggy Nordberg, Dave Nordberg. One of my goals is to place most if not all of his old articles on this website. Hopefully, at some point, I hope to make all of his Almanacs in ebooks, and perhaps, reprint the out-of-print editions. Before my father taught deer hunters how to use tree stands in the 1970's, only a handful of hunters used treestands  and they were usually farmers hunting their land from traditional locations. Before then, at best, the average hunter might have climbed up on a windfall  but that was about it. 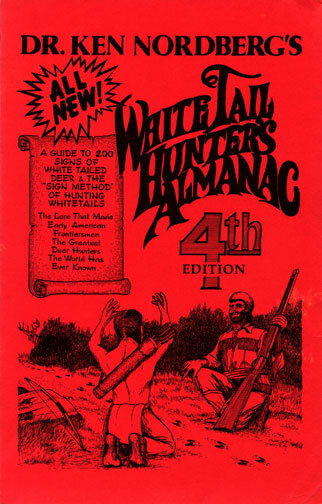 His Almanacs and published hunting articles taught us everything we now take for granted about using treestands. 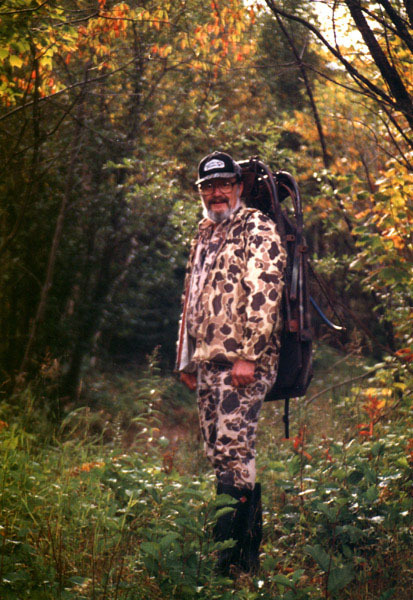 When commercial treestands became available, he helped promote them. I remember going to hunting shows with my father and talking with hunters about tree stands. We even set up a huge contraption at many shows that had 3 vertical poles that allowed us to demonstrate how to use the first climbing tree stand, "The Tree Lounge." (The last I heard, the owner Bob Hice passed away, and his tree stands are no longer available.) Here is a slide I scanned from those early days. An early photo of Doc demonstrating the first climbing tree stand  a "Tree Lounge." I have many memories of helping my father at hunting shows when I was young  over 35 years ago now. I talked with thousands of deer hunters. Back then, one of the funniest things they would say to me was, "Tree stands! No way. I'll never use them. I hunt the old-fashioned way." Back then, that meant either using large group drives, or wandering around in the woods. Almost single-handedly, my father broke those old-fashioned deer hunting traditions. In recent years, I have run my own booth at a few deer hunting shows  helping to keep my father's legacy going. At those shows, the funniest thing I have heard a hunter say to me is, "Ground stools! No way. I hunt the old-fashioned way." Now-a-days, that means, using a tree stand. They say this without understanding my father is the reason they are in a tree stand. Another very funny  yet sad  comment I have heard hundreds of times at hunting shows over the years is, "I don't read." Literally, I would say, "Would you like to hear about my father's books?" Then, they would say, "No. I don't read." It's true  unfortunately  way too many deer hunters still don't, or can't read. Personally, I still have, and use, my Tree Lounge. I have a location I call, "Bog Point" where it would be impossible to hunt without using a climbing tree stand. I hunt from ground blinds most of the time. In recent years, I have hunted from tree stands only about 10% of the time. My reason is not really a preference for or against tree stands  it has to do with tactics. My specific hunting area does not have many specific locations where deer are likely to be located  specific locations for a tree stand. Instead, it has many larger areas  specifically, doe-family-unit feeding areas  where doe-family-units feed. In other words, my geography does little to concentrate the deer in my area. Personally, I like a high view like most hunters. However, for me, it is better to change my locations every half day  based upon fresh sign and weather conditions. For me, over a 10-day hunt, I would need about 20 tree stands to properly cover my area. Instead, I have preselected at least 100 good ground level locations to sit on my portable stool. Indeed, some are located on natural high points with excellent long-range views. Some are located behind a windfall, a boulder, a stump, a clump of trees, or a pile of brush. However, keep this in mind. Because my father pioneered the use of tree stands, us Nordbergs use tree stands all of the time. My brothers Ken and Dave usually have about 5 tree stands each, for themselves and each of their sons. 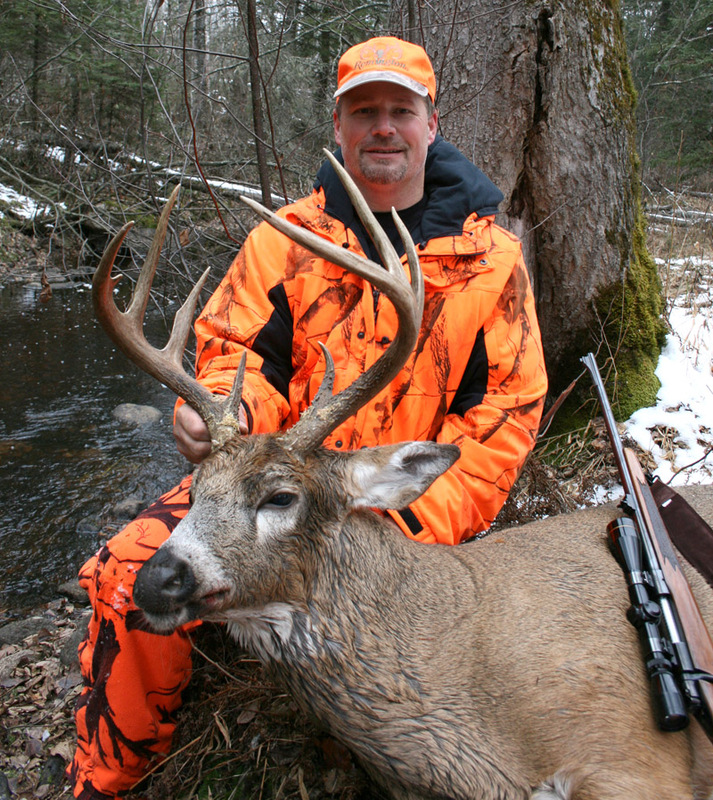 For example, my brother Ken, shot this nice buck from a tree stand in 2012. 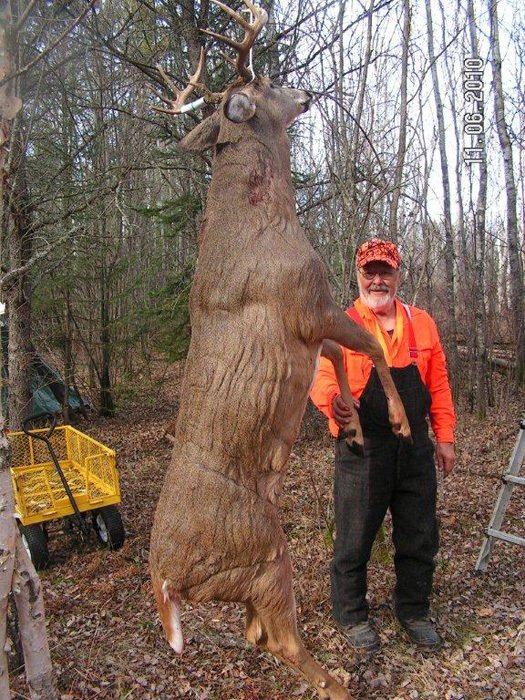 Ken Nordberg  8-pointer (2012)  shot from a tree stand. Ken is one of the most successful mature buck hunters in the world  and he almost always hunts from a tree stand. (Yes, he has shot a number while walking to and from tree stands, and even one while using an outdoor latrine!) Recently, Ken mentioned to me that he would have never seen, much less taken, many of his bucks, if he had not been in a tree stand. So, when young say that my father is against tree stands, that is obviously false. What young hunters should do is learn how to position their tree stands as effectively as my brother Ken Nordberg. Obviously, the Nordberg children/grandchildren's skill and success at hunting large whitetail bucks comes directly from the teachings of our father/grandfather. I can only recommend that any hunter that wishes to become a regularly successful trophy-class buck hunter learn about my father's knowledge, skills, and tactics. He is  and will always be  the leading expert in his field for a reason. After all, he literally revolutionized the field of deer hunting. Finally, I hope readers understand this detail. My father is now almost 80 years old. His preference for use his Portable Stump Hunting technique versus his Tree Stand technique now probably has more to do with safety than tactics. Personally, I would never recommend that someone 60 years or older hunt from tree stands. By the way, how many people can say, "hunting from tree stands" is "HIS" technique? Only Dr. Ken Nordberg can rightfully say that. Anyhow, back to my father's article. In this article, he is talking about the location of a ground blind. He decided the location of this ground blind using almost exactly the same knowledge and skill a hunter should use to locate the position of a tree stand. In this specific situation, this area was logged roughly 14 years earlier. In this area, the loggers left no mature trees. Around the best location for the stand site, there were simply no mature trees that could be have been used for a tree stand. There is no doubt, my father's wolf-inspired technique  known as, "Portable Stump Hunting"  was the best tactic for this situation. When we finally stepped into that grassy opening on the third day of scouting, it didn't take long to realize this was a very special area. The path taken by the two bucks a year earlier was now a much-used deer trail with lots of fresh, four-inch-long deer tracks and old and fresh clumps of inch-long deer droppings; signs that could only be made by one or more exceptional bucks. Through the deep grass down the center of the old logging trail was a similar deer trail, equally full of tracks and droppings of the same size. Six new antler rubs on three- to five-inch diameter tree trunks marked the length of the grassy opening and two newly-freshened ground scrapes one about three feet in diameter and the others about five feet in diameter were located 20 feet apart about the junction of the two deer trails. No doubt about it, the buck that made all of these signs was as big as they come in our hunting area, a 10-pointer or better in its prime, likely one of those 300-plus-pound brutes we Nordbergs have occasionally taken during the past 20 hunting seasons. After stomping down grasses and other vegetation behind a small clump of spruces 50 yards north of the trail junction, creating a well-hidden, nest-like, ground level stand site with a solid spruce and aspen background, we beat a hasty retreat northward, hopeful the buck that spent a great deal of time at this site would not be spooked enough by our invasion and lingering scents to begin avoiding it. At 4 a.m., on November 5, smoke drifting from the chimney of our wall tent wood stove confirmed the wind direction forecasted on our weather radio the evening before was correct: the wind was blowing lightly from the southwest. The arrow on our campsite thermometer pointed at 22 degrees, well within the range in which whitetails with winter coats are most active. Breeding began in our region one to three days earlier, so today 10-12% of our does could be expected to be in heat. Bucks would be on the move, searching for does in estrus or accompanying them. Also, there was no moonlight, meaning deer would be active later than usual during the coming daylight hours ... maybe. As perfect as conditions seemed, we realized things might not turn out as we dreamt they would. One possible negative factor was increasing wind velocity. Today, the wind was supposed to increase to 10-15 mph. When wind velocity is 15 mph, or greater, making the woods dangerously noisy to whitetails, our deer typically head for the safety of their bedding areas and stay there until is quiet again. We hoped this wouldn't begin to happen until at least 10 a.m., but you never know; November winds are fickle. Another worrisome thought was the temperature. It was supposed to rise into the 40s. When the temperature is much above 40, whitetails with winter fur are likely to remain bedded throughout the warmer daylight hours. Then there were the wolves. For the first time in 21 seasons, two family groups of grey wolves traded howls from within a mile or more north and south of our camp. Unlike during past deer hunting seasons, when a single group passed through our hunting area every four to five days, spooking our deer and temporarily making them even more difficult to hunt, these two groups weren't going anywhere. They had been howling with unusual frequency, day and night, throughout the previous 72 hours. Thus, at 5 a.m., when we turned off the lanterns and headed off toward our distant stand sites, there were plenty of reasons to believe gunshots might be very uncommon on this particular opener. It was almost 6 a.m., when John, Jimmy and I came to the split in the trail where John would turn east and Jimmy and I would head south. One hundred yards beyond this split, I guided Jimmy to the dead-limb blind he helped to construct on the south slope of a heavily wooded depression we refer to as Dark Valley. From there I continued south. A narrow strip of the southeastern horizon was becoming silvery as I began my descent down a rocky, glacier-scraped slope toward the final connecting deer trails leading to my stand site. From this point on, I noted with satisfaction, the breeze would be on my right cheek. About 100 yards short of my destination, I halted, turned off my green-bulbed cap light and dropped it into a pocket. While waiting a couple of minutes for my eyes to become accustomed to the darkness, I noticed a new antler rub on a five-inch-diameter aspen trunk next to my right elbow. If I had needed anything to generate excitement that morning, this was certainly it. With renewed caution, I began tiptoeing south on the deer trail leading to the dead grasses of the old logging trail, deliberately bending my knees and putting my feet down lightly as I have so often instructed other hunters to do when approaching a stand site. Soon, there it was on my right. Three steps put me in the little nest behind the spruces. There, I eased my stool from my shoulders, placed it on the ground and sat down without discernible sound. I then removed my cap, slipped on my camo head net, adjusting the oblong eye-hole around my glasses and returned my cap to my head. After pulling on camo gloves, I checked to make sure I would be able to raise my rifle and take aim between the spruce boughs in front of me without difficulty or sound. Satisfied all was in order, I then sat back to await dawn, wondering what the buck I had never seen would look like. With the appearance of the first rays of the rising sun came the familiar "wuff-wuff" of raven wings overhead, the "dee-deees" of inquisitive chickadees inspecting me from bobbing branches a few feet away and the long trill of a nearby red squirrel greeting all denizens of its forest domain  delightful sounds and sights know to few humans except us Minnesotans who deer hunt. At 8 a.m., I noticed the wind had freshened to at least 10 mph. Retained leaves of a scrubby red oak about 100 feet away were rustling with unusual volume for this hour. Perhaps not too loudly yet, I hoped. At 8:30 the wind was definitely growing stronger. Just about the time I began to believe this morning was probably going to be a bust, two shots echoed from a distant location west of where I sat. No one in our gang shot, I decided, but at least it appeared deer were on the move. Then at 8:45, almost as if someone had suddenly turned on a projector that cast an image on the screen, a huge buck with enormous antlers was standing broadside at the junction of the two deer trails 50 yards upwind. Instinctively, my rifle came to my shoulder, the safety was silently eased off and the crosshairs of my scope centered steadily on the buck's thick neck (my favorite target). Without hesitation I squeezed the trigger and the buck dropped from sight, hidden in the deep grasses. At 11 a.m., I found most of my sons and grandsons back in camp, trading tales about wolves and antlerless deer seen that morning (deer numbers being perennially low, we generally limit our harvests to adult bucks only). Having not heard my shot, no one knew I had a different tale to tell. After a few minutes I finally raised a hand and said, "I need help. 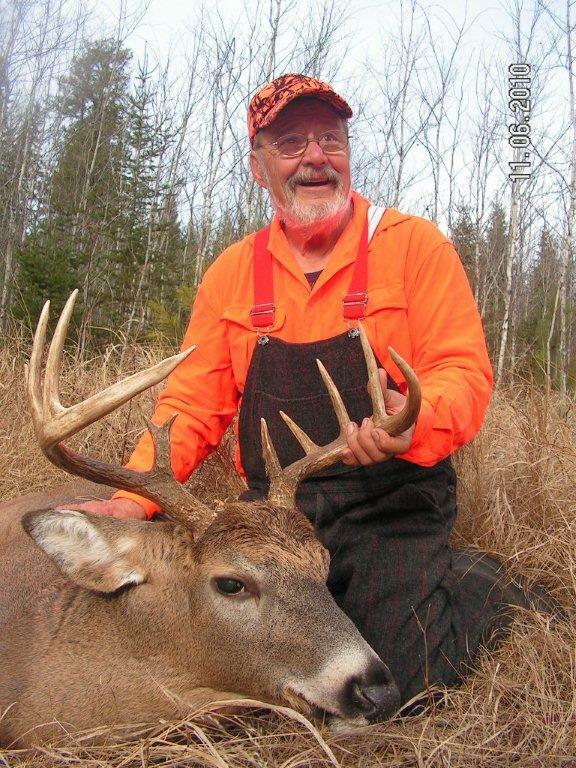 At quarter to nine I got one of the two biggest bucks I've ever taken in 65 years of hunting." "Okay!" my grandson, Tyler, yelled. "Because of the wolves," I continued, "we need to get that buck to camp as soon as possible. If we bring it out the way I went in, it will take hours. I've got a shortcut figured out. That buck is only about 300 yards from the main road. We'll have to drag it out through an alder swamp but it won't take as long. I'll go hitch up the trailer and load the sled, rope and some water. You guys get your vehicles and follow me." "How big are its antlers? Dave asked. "I guess you call it a 10-pointer," I answered. 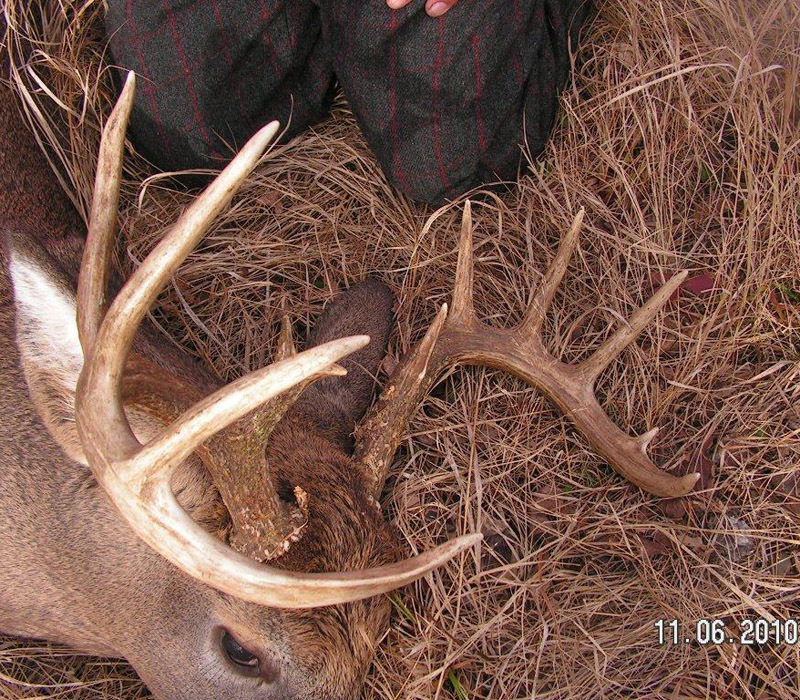 A close up of the rack on Dr. Ken Nordberg's 2010, 12-point buck. With five cameras clicking at the kill site, Dave turned to me laughing. "Dad, you can't count," he said. "Look here." With a finger he began counting tines, counting, "One, two, three, four, five, six, seven, eight, nine, ten, eleven, twelve. This is a 12-pointer. It looks like you've got a taxidermy bill coming up." The big buck hanging back at camp. Note the optical illusion is this photo. It was taken with Doc standing a couple of steps behind his big buck. This makes it look larger than it really was. (It looks like a one ton buck!) In reality, it weighed about 300 pounds AFTER it was field dressed. He was right. A European mount (boiled skull) didn't seem right for this buck. It was too beautiful and too big for that. Nonetheless, long being retired, I worried about the cost. One of my boys recently paid $600 to have a buck mounted. Ten days later, while inspecting the frozen head and hide, my friend Dwight Forsberg of Wilderness Taxidermy in Maple Grove (MN) said, "Most hunters never get one like this. This is a buck of a lifetime. It deserves to be on the wall where it can be admired by you and your family of hunters and your future generations." "Mount it with its head turned a bit to its right," I said, digging out my checkbook.